What Happens if You Skip Regular Auto Maintenance? Routine maintenance. It’s a part of life. If you avoid the dentist for years, you’re going to end up with gaping cavities. If you don’t get a regular checkup, who knows what kind of hidden health problems you’ll develop over time. And if you ignore that check engine light or your oil change reminder sticker from your Portland auto repair shop, it’s gonna cost you in the long run. But have you ever wondered just how much? Let’s take a look at some of the most commonly neglected auto maintenance tasks and exactly what they can do to your car if you decide to just ignore them. Your engine is like the heart of your car, and clean oil is what keeps it ticking on time. Oil provides the necessary lubrication so that every intricate piece of the engine can move smoothly. The longer the oil runs in your engine, the more dirt, condensation, acid, and other impurities build up, transforming it into a thick sludge that won’t lubricate a thing. Most manufacturers recommend an oil change every 5,000 miles or every 4 months, and a year’s worth of oil changes will probably run you less than 200 bucks. When you run on old, dirty sludge, however, you are reducing the life of your engine and risk it kicking the bucket prematurely, which could cost upwards of $4000 to replace. Next time that little reminder sticker nags at your auto repair conscience, don’t ignore it. If you didn’t get the message from the information about oil changes, you should never neglect a single piece of maintenance related to your engine. That goes for timing belts as well. 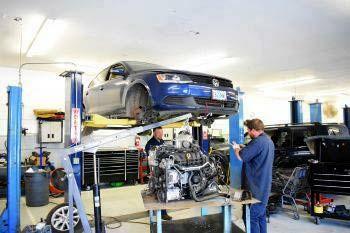 Your timing belt is what’s responsible for making sure that your camshafts open and close valves at the proper intervals. Most manufacturers recommend that you get your timing belt replaced between sixty and ninety thousand miles. For the typical car owner, that’s only once or twice during the life of the car. But what happens if you skip out on this approximately $600 repair? Well, if your overworn belt snaps or slips on the road, your engine will stop running, which could prove disastrous if you’re pushing 70 on the highway. But, regardless of where your engine breaks down, it’s going to cost you a tow—and you’ll still have to replace the belt. If you’re lucky, that’s all the damage that’s done. The less fortunate timing belt neglectors are going to face a hefty couple thousand dollars in engine repair due to bent valves or other damages. Some engines might even need to be replaced completely. We tend to drive in similar patterns most days of our life. Left out of the driveway, right onto Airport Way, left onto 205. Unfortunately, our patterns aren’t even, which means neither is our tire wear. Regular tire rotations, every 7500 miles or so, involves swapping the locations of your tires so that they wear out more evenly, thus extending their overall life. Even if you get your tires rotated with every oil change, it’s going to cost you less than $200 a year and could give you an extra 10,000 miles on your tires. That’s a worthwhile investment considering replacing all four tires could run you around $600. If your car makes a horrible squealing sound when you hit the brakes, it’s likely a sign that your brake pads have worn out (probably because you passed on your last offer for a brake inspection). Brake pads are what causes the friction necessary to slow down the vehicle whenever you hit the brakes. If they are worn away, your brakes will function much less effectively and you risk damaging your rotors or brake discs. Brake pad replacement frequency depends a lot on the type of driving you do, but an annual brake inspection should provide your mechanic with enough information to let you know how much life your brake pads have left. Replacing them costs an average of $150 per axel. Compare that to the average $400 for new rotors (which would be on top of new pads), and you can see how important it is to keep up on regular brake maintenance. It’s cheaper to brush and floss than it is to get a root canal. Eating a diet rich in whole grains and veggies costs less than coronary bypass surgery. And oil changes cost less than engine repair. You just can’t afford to skip out on regular car maintenance. All of the things we’ve covered—oil, timing belts, tire rotation, and brake pads—need to be taken care of eventually, so you might as well do it on time. If you’ve been putting off any aspect of maintenance, for any reason, call today to let Steve’s Imports, your local auto repair shop Portland, get your car back in shape.